Number 3/ quantities to 3. 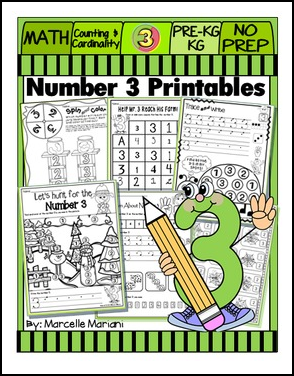 This package contains DIFFERENTIATED worksheets to teach the number 3 and number sense for 1-3. There are 28 total worksheets to teach the number 3 and concepts of 1-3 (counting, tracing, quantities). • K.CC.C.7- Compare two numbers between 1 and 10 presented as written numerals. I HAVE INCLUDED A VISUAL OF EVERY SINGLE WORKSHEET IN THE PREVIEW FILE. PLEASE TAKE A MINUTE TO VIEW IT AND MAKE SURE MY TEACHING STYLE SUITS YOURS.